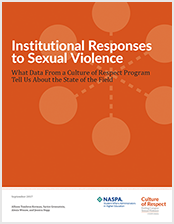 Our signature tools advance your institution’s approach to addressing sexual violence. 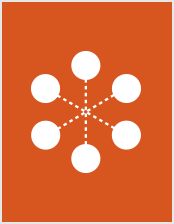 Includes our CORE Blueprint, CORE Evaluation, and CORE Constructs. Details our 14-institution pilot program, the results of which support its use as an effective model for diverse institutions of higher education across the nation. Chronicles the myriad ways in which Collective institutions are meeting federal guidelines and implementing recommended practices and programs from experts in the field. Culture of Respect is an initiative of NASPA, the leading association for the advancement, health, and sustainability of the student affairs profession. 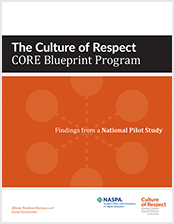 Culture of Respect is housed within NASPA’s Health, Safety, and Well-being Initiatives. NASPA offers a variety of tools, resources, and professional development opportunities to support higher education’s efforts to end campus sexual violence. The Health, Safety, and Well-being Initiatives of NASPA support student affairs administrators working towards creating well campus environments, and houses Culture of Respect. CPE is an effective strategy for building a well-educated and sustainable peer education group. CPE Training helps peer educators develop leadership skills to be able to successfully create and implement campus programs. The CPE Train the Trainer Course walks participants through the CPE Program and provides tips and other useful information to aid in facilitation of CPE. These concurrent conferences provide student affairs practitioners with the knowledge and skills to effectively address collegiate alcohol and drug abuse prevention, mental health, sexual violence prevention and response, and well-being through a variety of comprehensive and integrative approaches. Students and advisors from across the nation gather to be inspired, share ideas, and build exceptional peer education programs promoting strategies in health, safety, and student leadership. These volunteer-led groups of NASPA members share information and resources in important areas of student affairs. The work of many Knowledge Communities connects to sexual violence prevention and response: Campus Safety and Violence Prevention, Gender and Sexuality, Men and Masculinities, and Sexual and Relationship Violence Prevention, Education, and Response. RPI intentionally links research, policy, and effective student affairs practice in support of student success. For more information, resources, or programs related to sexual violence and related issues, please check out these colleague organizations.